In this episode of Inbound Sales Journey, Gray and Ryan discuss the book "Same Side Selling: A Radical Approach to Break Through Sales Barriers" by Ian Altman and Jack Quarles. The book covers how to get both sides in sales on the same side of the table and turning sales into a win-win solution. Typically sales are treated as a zero-sum game. This book shows you how to help both sides aligned in finding the best solution for the prospect. By approaching agency sales this way, your agency will avoid coming across as a pushy sales person and rather trusted consultant. Same Side Selling gives you the tactical steps to setting up this type of sales process. One huge factor is setting expectations. Your engagement with a client, you will either meet, fail, or exceed expectations. During a sale, being diligent to outline this and being honest with them will help you improve your client relationships. If a prospect isn't a good fit, and you know that you can't solve the issue for them, recommend them another solution. By being honest and trying to solve their problem as best you can, you gain credibility and set your agency apart from the competition. Same Side Selling is a book that will help agency owners close more deals and set them up for success in selling. A Free Sales Process Checklist? 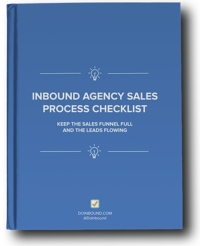 Subscribe to receive future Inbound Sales Journey episodes, plus the Inbound Agency Sales Process Checklist! Discover the detailed steps to implement a sales system for your agency. I focus on ZenPilot's growth and marketing. I've worked with a variety of start-ups and businesses to achieve fast growth, increase their revenue, and become more profitable. When I'm not working on ZenPilot, I'm outside, traveling or reading.